The following information is condensed and edited from http://www.mlmwatchdog.com/ and is used with permission of the Owner and Editor, Rod Cook. I recommend you subscribe to the MLM WATCHDOG newsletter by clicking on “Free Newsletter” at the upper left of the opening page of the web site. Montana Commissioner of Securities and Insurance Monica J. Lindeen recently fined Bozeman, Montana resident Scott Wacker and his company, Funky Shark, $40,000 for illegally selling investment opportunities. It wasn’t killed because it was a Ponzi – It never quite got to the point where it could take off. Little known to most MLM leaders, Founders programs, if not properly structured, can be deemed a form of an unregistered security to fund new MLM Companies. They are hardly ever registered with State Securities offices as many should be. A common way of raising funds for small new MLM – Network Marketing companies is to get MLM Distributors (known as Founders) to invest $500 to $10,000 to provide the money to start the new company. To avoid criminal prosecution the owner Wacker agreed to pay back more than $834,000 to the MLM Founder investors to resolve a restraining order Lindeen’s office filed against him in state court. 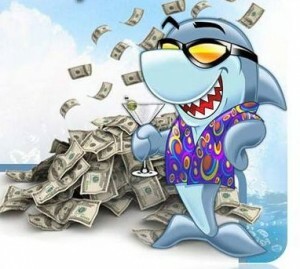 Last September, Wacker began recruiting investors for his penny-auction website, FunkyShark.com. By the end of October, Wacker had raised over $1 million from MLM Founder investors across the world. The quick growth in the Funky Shark bank accounts from Founder’s deposits alone were ready to cause problems for owners and MLM Founders both. As can be expected: The flurry of high dollar transactions in Wacker’s personal and business accounts led his bank to file a a State and Federally required suspicious activity report, which was referred to Lindeen’s office. After a quick review, investigators suspected Funky Shark was a pyramid scheme. They quickly requested a restraining order to prevent additional investors from getting involved. On Oct. 30, 2012 Wacker posted a notice on Funky Shark’s website explaining that it’s investment program “may violate certain securities laws in the United States.” That was a nice way of saying that it was illegal without a full court decision. In the two months it operated, Funky Shark paid nearly $378,000 in commissions to Founder participants who recruited new members. Those commission payments left Funky Shark unable to repay all of its participants in full, so Wacker agreed to pay $270,000 out-of-pocket to make investors whole. These MLM Founders were lucky, as there have been cases where government regulators have done “Clawbacks” and taken all the money back from MLM Founders Groups.